32 high quality sides by one of the iconic singers and musicians of Memphis blues and boogie, recorded when he was part of the small group scene, renowned for his prowess as a harmonica player and vocalist! 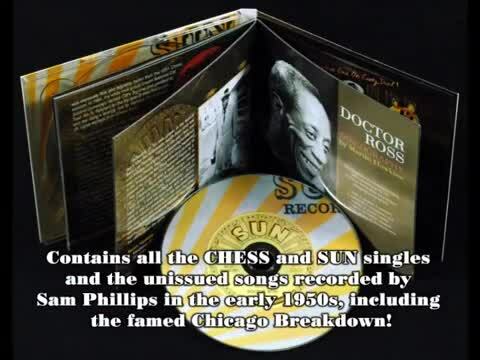 Contains all the Chess and Sun singles and the unissued songs recorded by Sam Phillips in the early 1950s, including the famed ''Chicago Breakdown''! Also contains all the DIR, Fortune and HI-Q singles made in Michigan, including the equally renowned Cat Squirrel! The booklet contains rare photographs, and liner notes by Martin Hawkins! Isaiah Ross was born in Mississippi, made his reputation as a bluesman in Memphis, then moved to Michigan emerging occasionally to perform as a one-man band. Ross was not the first to use the theme of the musical medic come to help you feel better, but Ross was one of the very best at creating highly rhythmic back country dance music and at recycling folk blues couplets, mainly drawn from the recordings of Sonny Boy Williamson, to which he added some of his own wry humour and wit. From the beginning with Sam Phillips in Memphis, his style on Chess and Sun had a freshness that sounded current and he made a surprisingly wide range of blues recordings on the Detroit labels DIR, Fortune, and HI-Q. Sam Phillips once said: "Doctor Ross had a very special sound. He had a great command of his music and a real instinct for what was going on around him. ''Chicago Breakdown'' is one of the better records I think I ever heard in my life''. DOCTOR ROSS - With a stage name of ''Doctor'', a theme song about curing the boogie disease, and over 30 years performing as a one-man man, it's no surprise that fans, publicists and commentations built Doctor Ross into an even more clear-cut groove than he developed for himself. But back in the early 1950s, the music Ross made for Sam Phillips was not performed as a one-man band and it had a freshness that sounded current even though it was based on much older songs and styles. Doctor Ross was not the the first to use the theme of the musical medic come to help you feel better - Doctor Clayton and others got there first - but Ross was one of the best. Georgia Tom recorded some musical medic themes pre-War but Ross's take on it was the boogie - that if you wanted to hear the music, or wanted to dance, or wanted the other thing, then he was your man. Born in Tunica, Tunica County, Mississippi, in October 21, 1925, gained his nickname in the US Army and is reference to some medical knowledge he obtained while in the service. He played for his service buddies in 1943 into 1947 in the Philippines at the Pacific Theater of Operations and frequently entertaining the troops, and in 1950 became fully professional, broadcasting over radios KFFA, WROX and finally WDIA in Memphis. Charles Isaiah "Doctor" Ross played a guitar and a harmonica mounted on a rack around the neck while playing a bass drum and/or high hats with foot pedalsand, he played also the kazoo. Ross were at their best playing rhythmic riffs and boogie-woogie patterns, which gave a fuller sound. Perhaps it was the surplus of country blues talent and the notorious competitiveness of the blues scene in Memphis that sustained this one-man band, for they could simulate the sound of a larger combo while being hired to perform for the price of a lone musician. Doctor Ross grandparents were Indians, his father was Jake Ross, a farmer who played the harmonica. Ross is raised on a farm and is one of 11 children, was interested in music in the early years and learned the harmonica at the age of 6 years. Occasionally he worked at the local churches and parties in Tunica, Mississippi area in 1934 and worked with George P. Jackson at the local roadhouses and juke joint in Tunica, Mississippi in 1936. In the late 1930s; he teamed with Willie Love to on tour with the Barber Parker Silver Kings Band and working on dances through the Mississippi Delta; worked with Wiley Galatin, or solo, at the local house parties in the Tunica area in 1942 into 1943. After the Army in 1947, Doctor Ross returned to Tunica to work outside the music on a farm and appeared on WROX-radio in Clarksdale, Mississippi in 1947, and frequently worked at the local dances, parties and picnics in the Tunica area through the end of the 1940s; appeared with his own Doc Ross and His Jump and Jive Boys on Katz Cloting Shore Show on KFFA-radio in Helena, Arkansas in 1949; worked on Owl Cafe in Helena, Arkansas in 1949; working on Hole-In-The-Wall; the Isidore's Bar; the Roger's Club and appeared with Sonny Boy Williamson II (Alex Miller) on the King Biscuit Time on KFFA-radio in Helena, Arkansas in 1950. He also appeared in 1950; with his own Doc Ross and His Jump and Jive Boys on WDIA-radio in Memphis, Tennessee. Sam Phillips heard this broadcast and invited him to the Memphis Recording Service studio. He recorded with the Doc Ross and His Jump and Jive Boys for the Chess label in Memphis, Tennessee in 1951. Recorded for Sun Records in Memphis, Tennessee from 1951 into 1954. He was heavenly influenced by Joe Hill Louis and, like him, recorded a great deal for Sam Phillips. His two singles "Come Back Baby"/"Chicago Breakdown" (SUN 193) and "The Boogie Disease"/"Jukebox Boogie" (SUN 212) sold quite well. Doctor Ross married in 1952 and after divorce in 1954 he married that same year again. Ross have 2 children, and is influenced by De Ford, Arthur Crudup, Lonnie Glossen, George Jackson, Muddy Waters and John Lee "Sonny Boy" Williamson. Ross toured with the King Biscuit Boys on workings in juke joins through the Arkansas and Missouri area in the early 1950s; appeared on KLCN-radio in Blytheville, Arkansas in 1953, and worked outside the music in Champaign, Illinois. In 1953-54, Ross appeared on the Doc Ross Show, on WDIA-radio in Memphis, Tennessee and formed the group Dr Ross and the Interns group for working on local club dates in Memphis, Tennessee in 1953 into 1954. In 1954 into 1990s, he soon left Memphis and the music for the car plants of Flint and Detroit, Michigan often worked as one-man band in Flint, Michigan. Since rediscovery he has made many tours of Europe, playing as a one man band in Flint, Michigan and Chicago, Illinois from 1954 into 1970s; recorded on his own DIR label in Flint, Michigan in 1958; recorded for Fortune label in Detroit in 1959; recorded for Hi-Q label in Detroit in 1961 into 1963; recorded for the Testament label in Flint in 1965; worked at the University of Illinois, Urbana, Illinois in 1965; toured with the American Folk Blues Festival on working concert dates through England and Europe in 1965 (portion of the Hamburg, West- Germany concert are released on the Fontana label); recorded for the Blue Horizon. Xtra labels in London, England in 1966; worked at the Ann Arbor Blues Festival in Ann Arbor, Michigan in 1970; at the Holiday Inn Bar in Saginaw, Michigan in 1971; at the Mariposa Folk Festival in Toronto, Canada in 1971; recorded with The Disciples for the Foretune label in Detroit in 1971; toured in England and Europe on working concert dates, radio appearances and TV-show in 1972; recorded for the Big Bear-Munich label in London, England in 1972; recorded for the Esceha label in Koblenz, West Germany in 1972, and worked on the Montreux Jazz Festival in Montreux, Switzerland in 1972 (portion are released on the Big Bear-Polydor/Excello labels). In 1973, Doctor Ross on the Ann Arbor Blues Festival in Ann Arbor and toured with the American Blues Legends on working concert dates through England and Europe in 1974 (portions are released on Big Bear label); appeared on In Concert Show on Radio-4, London, England in 1974; worked BJ's Buffeteria in Bay City, Michigan in 1977, and toured in Europe working concert dates in 1977. According to Ross, Sam Phillips told him if he could find a white man who could play and sing as good as a black man, he would make him a million dollars. Doctor Ross recalls, "The next time I went back, Elvis Presley had come through... so they took my promotion off of my record and they put it on him... I was probably one of the first ones. Me, Joe Hill Louis, and Willie Nix. There was a bunch of us there that was on that thing. But we were the ones who really started it". There can be little doubt that Doctor Ross is one of the most individual and expressive blues singers and player around today, Ross has the artistic ability and lifetime experience to create significant blues. Charles Isaiah "Doc" Ross died at May 28, 1993 in Flint, Mississippi of the age of 68.